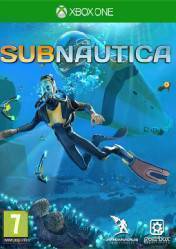 Attention: This version of Subnautica is for Xbox One and many of the stores listed in Gocdkeys, where you will find the best internet prices for this game and many others, offer a version in account format. PS4 accounts give access to the game simply by accessing them through a username and password that you will receive by email after purchase. These versions may have a regional block and are marked with the "Account Format" label in our price list. Subnautica is an adventure and underwater exploration game that takes place in a vast world under the sea, totally open and we can travel with total freedom, it is therefore an open world game where exploration and construction will be the basic pillars of the title. We will have to manage our oxygen supply while exploring the forests of algae, plateaus, reefs, and twisted cave systems. But remember that this alien ocean is full of life, and some of its inhabitants are very dangerous, so our priorities will be to seek, build and survive. To survive in this inhospitable ocean, we will have to build bases on the seabed. Choose designs and components, and manage the integrity of the hull as depth and pressure increase. Storing resources, taking care of your underwater vehicles, and maintaining your oxygen reserves will be vital keys to survival. There are no comments yet about Subnautica . You can be the first one! Podcast: Wargroove! Resident Evil 2! Subnautica: Below Zero!